Keep your favorite hair stylist looking great in the salon or at home with her own Hair Stylist Customizable Coffee Mugs. This Hair Stylist Coffee Mug is an unique personalized gift perfect as a thank you gift for a wonderful hair cut or color. These Personalized Mugs are dishwasher safe and holds 11 oz. Includes FREE Personalization! 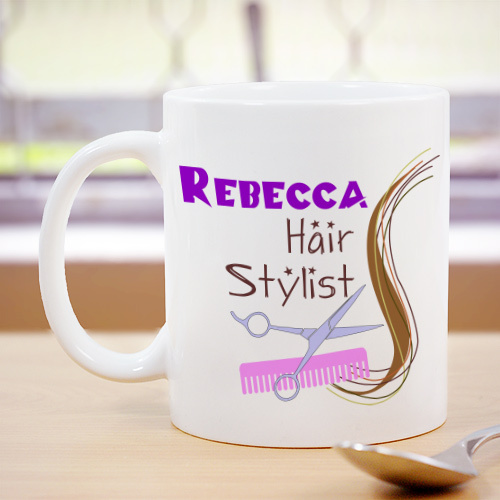 Personalize your Hair Stylist Coffee Mug with any name. GiftsForYouNow.com offers many unique Personalized Occupational Gifts. We can create fun and colorful Hair Stylist Gifts plus much more. If you are looking for a Personalized Gift for the Office, GiftsForYouNow.com has the right gift at the right price.